I shared with my Facebook fans a photo hint to this project. How many of you figured it out? The colors are pretty obvious to me! RAINBOW! But not just any rainbow, a rainbow shooting star! There were two reasons I came up with this pattern. First, I wanted a cool pattern to celebrate St. Patrick's Day coming up next week. Second, if you ask my kid what his favorite color is, he'll say "ALL OF THEM!" You can use this applique on any project: scarves, bags, décor.. anything! Notes: Rainbow Tail pattern is worked in rows without turning (except first row which is worked into chain). Begin each row with a slip knot of the new color working onto the first single crochet of the previous row. Row 1 (Indigo/Purple): sc in 2nd ch from hk, 1 sc in next 6 sts, 1 hdc in next 7 sts, 1 dc in next 6 sts. Fasten off. Row 2 (Blue): Sc into first sc of previous row. 1 sc in next 5 sts, 1 hdc in next 7 sts, 1 dc in next 7 sts. Fasten off. Row 3 (Green): Sc into first sc of previous row. 1 sc in next 7 sts, 1 hdc in next 7 sts, 1 dc in next 5 sts. Fasten off. Row 4 (Yellow): Sc into first sc of previous row. 1 sc in next 5 sts, 1 hdc in next 7 sts, 1 dc in next 7 sts. Fasten off. Row 5 (Orange): Sc into first sc of previous row. 1 sc in next 7 sts, 1 hdc in next 7 sts, 1 dc in next 5 sts. Fasten off. Row 6 (Red): Sc into first sc of previous row. 1 sc in next 5 sts, 1 hdc in next 7 sts, 1 dc in next 7 sts. Fasten off. 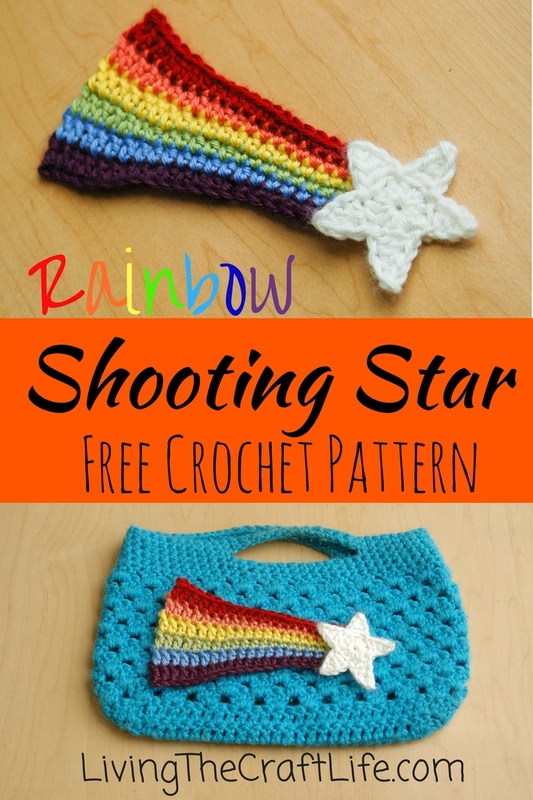 Tie in loose ends and sew the star onto the smaller end of rainbow tail. Round 2: *ch 4, working into ch-4 just made, sc in 2nd ch from hk, hdc in next st, dc in next st, skip 1 hdc from previous round, sl st into next hdc. Repeat from * around to make 5 points on the star. Fasten off.